Location: Originally at the end of Gallions Road on the north side. Gallions Road has now gone and the whole area has been redeveloped. Notes: The original Gallions Station was replaced on 12th December 1886 when the line had to be diverted slightly to the north to facilitate dock alteration. The new station was 275 yards to the east. 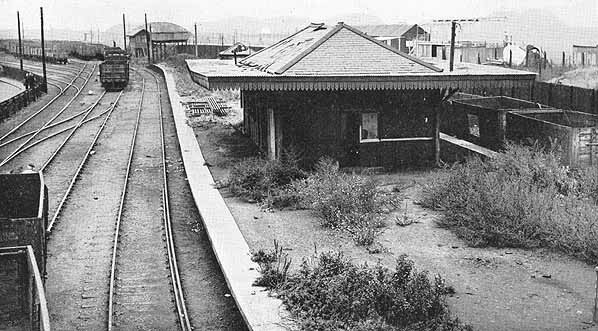 The new station consisted on an island platform with substantial wooden buildings which incorporated the booking office. The platform was reached by a footbridge from Gallions Road. The north platform face (Platform 1) was used by Great Eastern trains while the south face (Platform 2) was used fort the Custom House shuttle which was provided by the Dock Company. The original platform building was replaced by a smaller wooden structure in 1925 and the platform was shortened at the west end and extended at the east. When the Royal Albert Dock was built, the dock company obtained powers under the 1882 London & St. Katharine Dock Act 1882 to build a railway for both passengers and parcels from the North Woolwich line to Gallions Reach, passing alongside the northern side of the dock. Under the Act, the company had to provide trains every weekday morning for the convenience of "artisans, mechanics and daily labourers". The length of the branch once open to passenger traffic was 1 mile, 61 chains, from a point 34 chains east of Custom House Station. The first part of the line from Albert Dock Junction to Central was opened on the 3rd August 1880. The line between Connaught Road and Central was single but was doubled on 14th November 1881. Initially the service between Custom House and Central was worked entirely by the London & St. Katharine Docks Company with half-hourly trains from 8.30 a.m. till 6 p.m. but this was later increased to three per hour in 1881. To operate this service the company bought three second hand locomotives and passenger stock. No mention of a service east of Central Station is found in the Great Eastern timetables until July 1881, when that company advertised through trains hourly to and from Fenchurch Street. The local Custom House - Gallions service comprised twenty-four down and twenty-six up trains, all worked by the dock company, who hired the bay platform at Custom House for the purpose. The line between Central and Gallions was single until 1st April 1882 when a second track was added. The Gallions Hotel was part of Gallions Station with the front door of the hotel opening on to a part of the platform. It was built for the convenience of passengers leaving or joining their ship. From the 12th December 1886, the old station at Gallions was closed when the line had to be diverted to allow dock alterations. A larger station with an island platform was opened 275 yards further east with Great Eastern trains occupying the north side (platform 1), and the dock company's trains, on the local service, kept to the south side (platform 2). A few weeks later a new station replaced the old one at Manor Way. The line continued beyond the station at Gallions to a coal wharf and jetty at Gallions Reach. On 31st March 1909 the London & St. Katharine Docks Company was absorbed into the Port of London Authority. During the First World War, from the beginning of 1918, a special train service to Gallions was provided for munitions workers, who were brought by ferry from Woolwich Arsenal on the opposite side of the river. The stations at Manor Way and Gallions were rebuilt between 1924 and 1926, the latter being reduced in size moved a little to the east. Central Station was converted into a halt from the 1st November 1933. From 1st July 1896 the Great Eastern Railway took over the local Customs House - Gallions service running until 6th June 1932, when the shuttle service was suspended. The Sunday service ceased after 27th June 1915. The prosperity of the line reached its climax at the turn of the century; in October 1900, fifty four up and fifty-three down trains were advertised on ordinary weekdays. Of these, thirteen were through trains from Fenchurch Street to Gallions via Bromley, two trains worked through from Liverpool Street, two from Fenchurch Street via Stratford and two came from Stratford Market. The local service of seventy trains in both directions made up the remainder, bringing the total to 107 journeys. In general, trains called at all three intermediate stations but there were some exceptions. Passenger numbers dropped during WW1 and didn't improve post war and the service was cut back with seventy six fewer journeys in 1938 than in 1900. By October 1939, the total in both directions had dropped to twenty eight daily trains. On the 7th September 1940 the line was severely damaged during a German air raid. The line was repaired for the storage of wagons but the passenger service was never reinstated. The line was abandoned under Section 29 of the Port of London Act 1950. It was used for wagon storage at least until the mid 1960's. 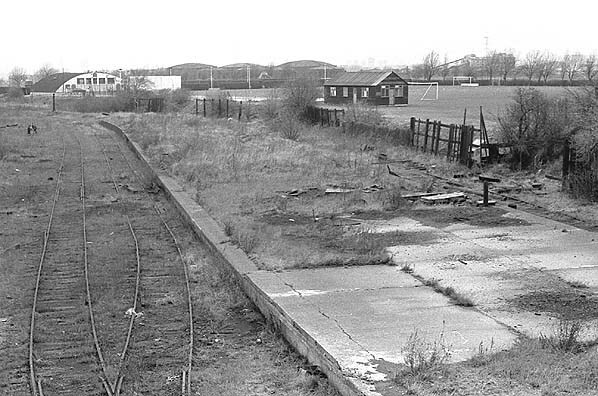 By the late 1960's the track had been lifted except at Gallions where it was still in situ until at least 1974. With the lifting of the track to the east, Gallions was later reached via a connection from freight lines to the south. 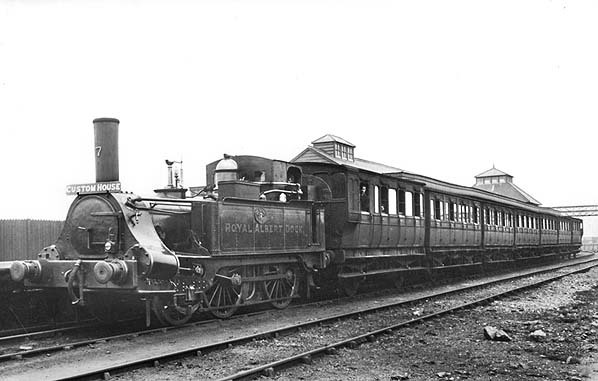 Gallions Station in about 1890 shortly after the new station was opened. Note the substantial station building which was replaced in 1925 with the building shown in the picture below.